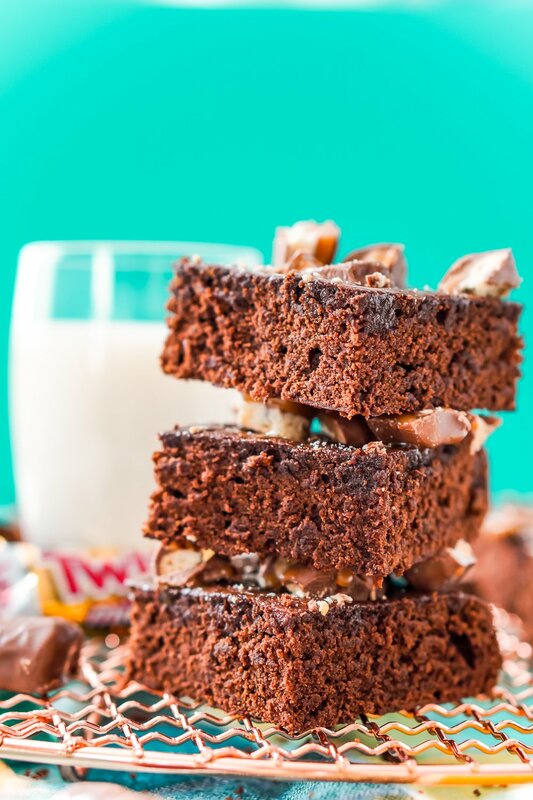 These Twix Caramel Brownies are a delicious cake-like chocolate brownie with Twix candy bars baked in, then drizzled with caramel and topped with more candy bar crumbles. 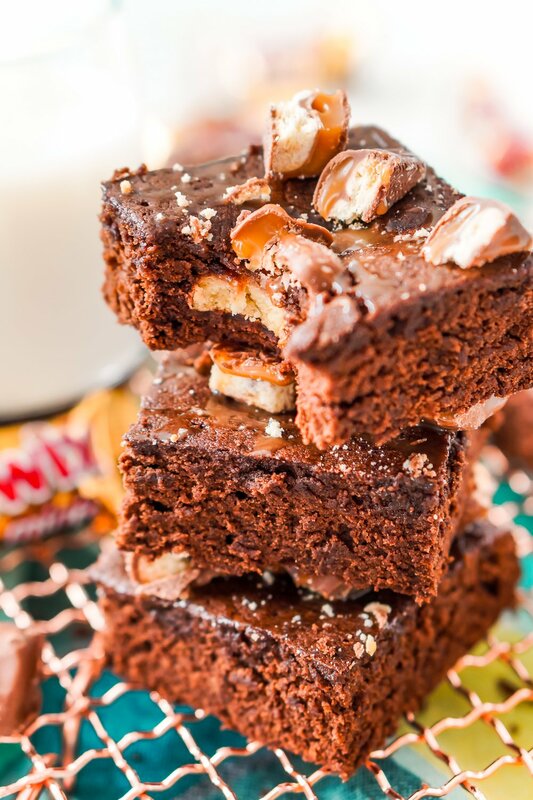 Twix Caramel Brownies combine two classics to create a single delicious dessert! Caramel and chocolate are one of those matches made in heaven. 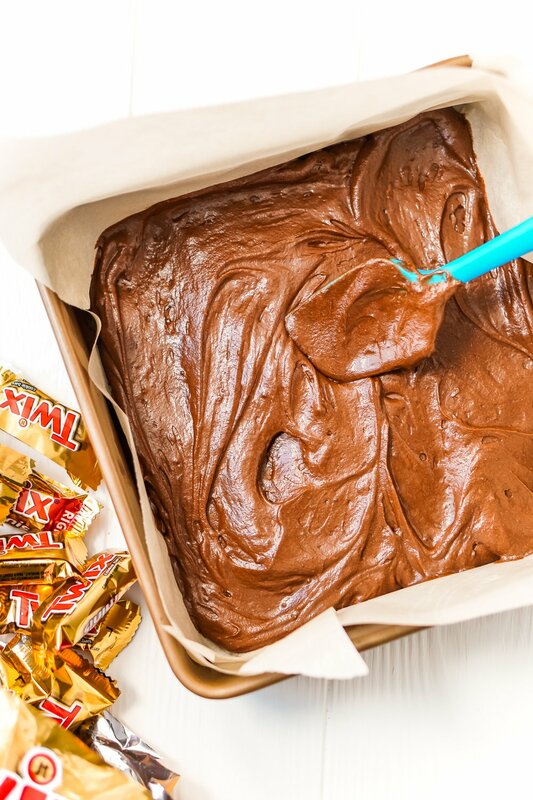 If you’re a fan of this combo — or if you can’t get enough Twix — you have to try this treat! 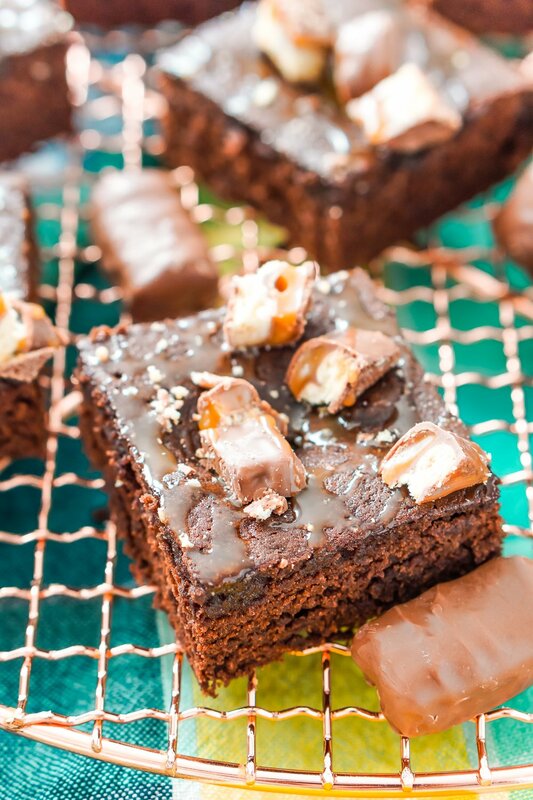 In the recipe, a mini Twix bar is nestled in the middle of each brownie, adding caramel and crunch to each bite. Then, a drizzle of ooey, gooey Caramel Sauce is added on top, plus more candy crumbles! The base of these Caramel Brownies is a simple, scratch-made Brownie Recipe that (I think) beats the boxed stuff. Although the boxed stuff is pretty great for making Brownie Cookies! Pantry staples like flour, eggs, sugar, cocoa powder, heavy cream, and vanilla (plus Twix and caramel) round out the ingredients. These brownies are really simple to make! Begin by preheating the oven to 350 degrees F and lining an 8×8-inch baking pan with parchment paper and set aside. Then, in a medium bowl, whisk together the flour, cocoa powder, salt, and baking powder and set aside. In a large microwave-safe bowl, melt the butter on 30-second intervals until melted. Whisk in the sugar, heavy cream, eggs, and vanilla until smooth. Add the dry ingredients to the wet ingredients and mix just until combined. Pour the brownie batter into the prepared baking pan. 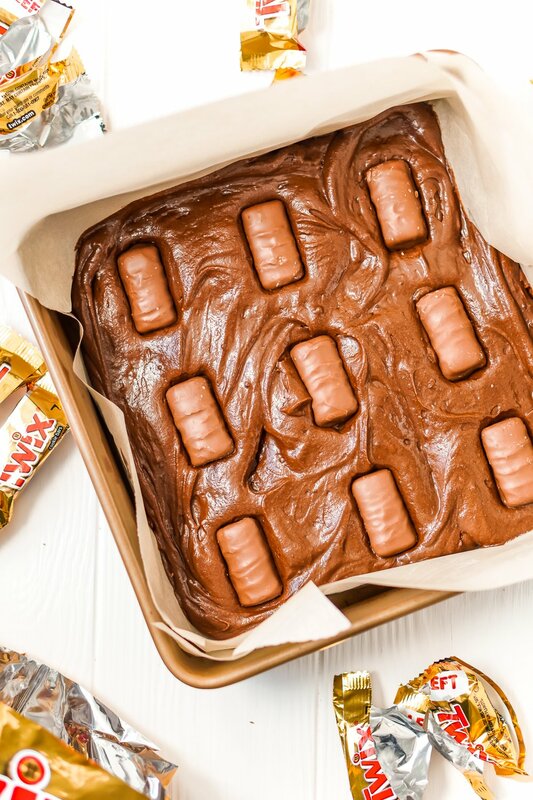 Unwrap the Twix bars and use 9 of them to press into the center of where each cut square will ideally be. Use a rubber spatula to spread the batter over the top of the bars. The batter covered bars will sit higher than the rest of the batter, this is fine as the batter will bake up around the candy bars and they will be level once baked. Bake the brownies for 20 to 22 minutes, a toothpick should come clean from the center. 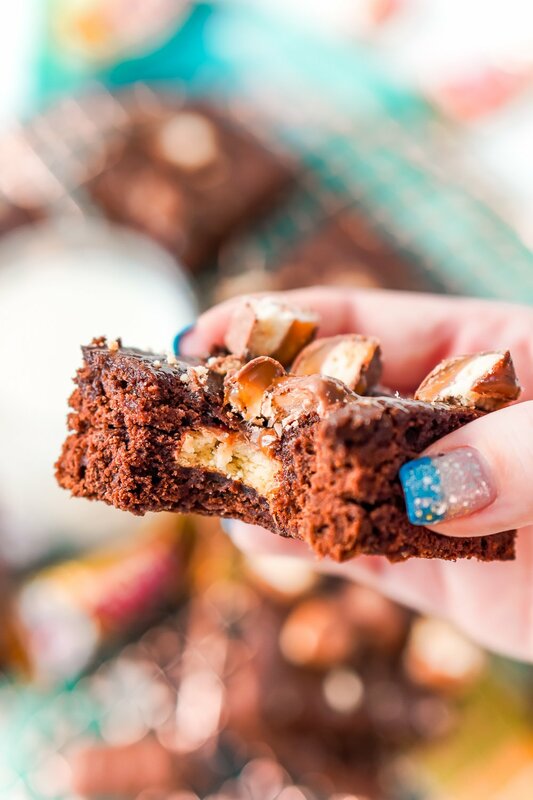 Remove from the oven and use the edges of the parchment paper to help you transfer the brownies to a cooling rack and allow to cool completely. 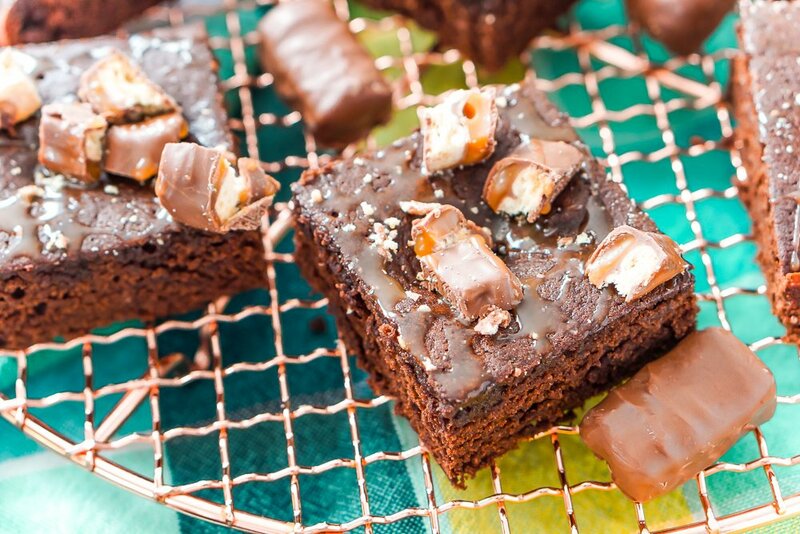 Drizzle the caramel sauce over the top of the brownies and chop up the remaining Twix bars and scatter them on top of the brownies. Slice and serve. 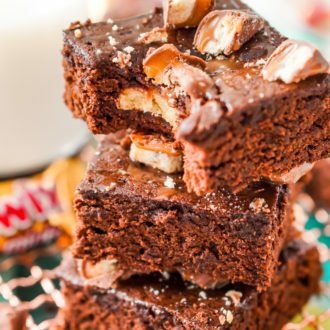 One thing to note: this Twix Caramel Brownie Recipe yields very cake-like brownies (as opposed to dense, fudgy ones). So while they taste rich, the airy texture makes them feel nice and light. So, do you know what that means…? They Make Awesome Brownie Sundaes! Top each chocolatey square with a vanilla ice cream and whipped cream for a rich and indulgent treat. Oh, and don’t forget the cherry! 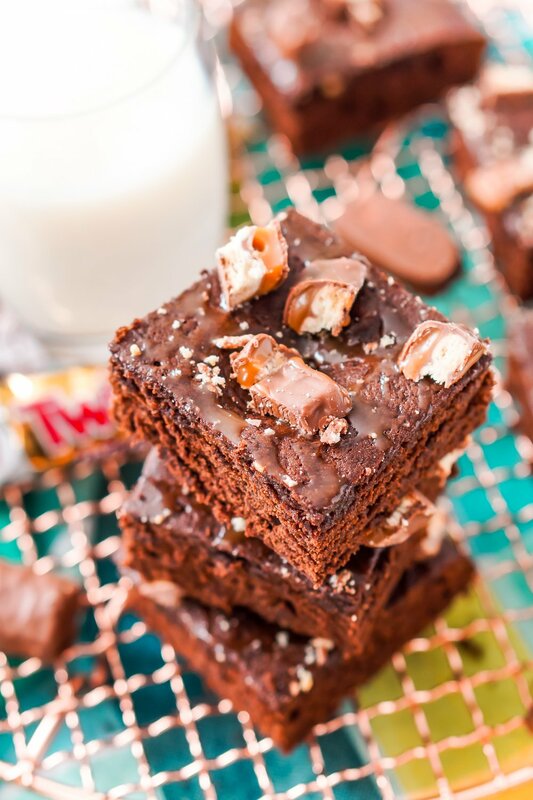 Not to mention, pairing Twix Caramel Brownies with ice cream creates a cool treat you can enjoy all summer long! The other thing I love about this dessert recipe is that it works for any occasion. Whether you’re planning a dinner party for adults or a get-together with kiddos, it’s a crowd-pleaser for all ages. Or, just whip up a batch to make any weeknight a little extra tasty! Looking for a crowd-pleasing dessert for all ages? 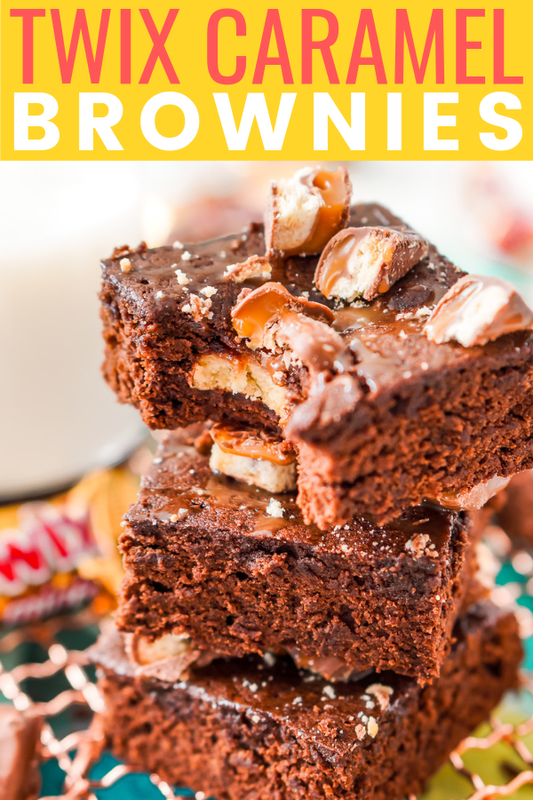 Twix Caramel Brownies combine two tried-and-true favorites into one incredibly craveable treat! Preheat the oven to 350 degrees F and line an 8x8-inch baking pan with parchment paper and set aside. In a medium bowl, whisk together the flour, cocoa powder, salt, and baking powder and set aside. Unwrap the Twix bars and use 9 of them to press into the center of where each cut square will ideally be. 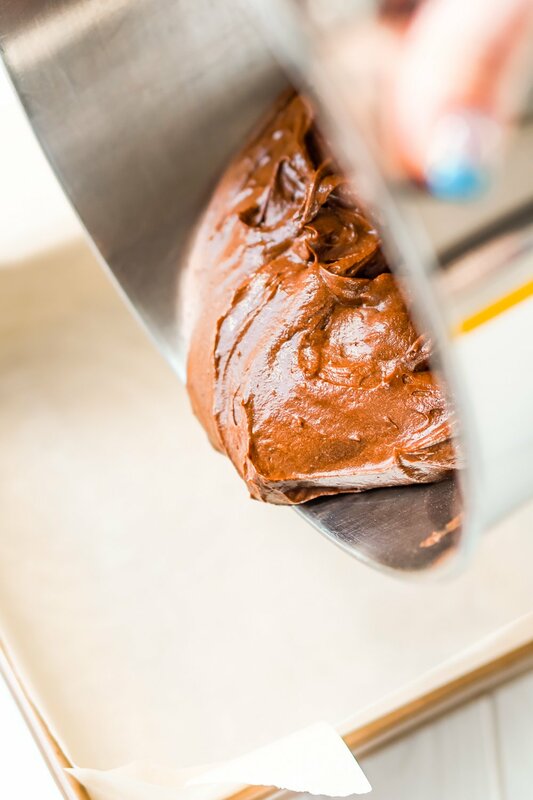 Use a rubber spatula to spread the batter over the top of the bars. The batter covered bars will sit higher than the rest of the batter, this is fine as the batter will bake up around the candy bars and they will be level once baked. Weight Watchers Value: 10 SmartPoints per brownie. Whole milk may be used in place of heavy cream.